S. N. Kreitzman Ph.D, R.Nutr. 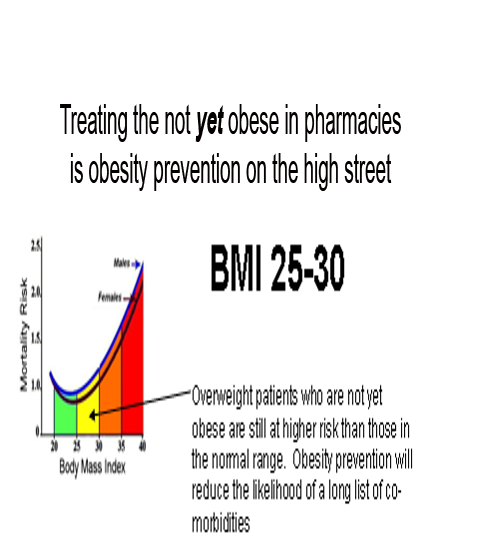 Treating overweight, but not-yet-obese people, in pharmacy, is obesity prevention on the high street. There are over 30 million overweight and obese people in the United Kingdom. Since no one ever became obese without first being overweight, it is important to provide real help to people at this stage. It is much less problematic to help people who do not have a massive amount of weight to lose and who also do not yet have some of the serious medical consequences associated with excess weight. 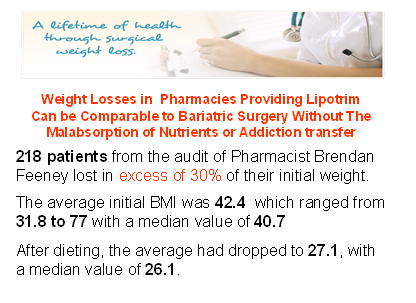 Pharmacy has become the prime location for weight management in the UK and Ireland. With the NHS ‘Call to Action’, pharmacy professional bodies are urging pharmacists to make their voices heard and shout about the good they do in improving people’s health. Take weight management for example. Helping people lose weight is not just about making them feel good but is also about preventing major long-term health problems, such as type 2 diabetes. This point was very well illustrated in a recent article in GP magazine that reported a staggering sevenfold rise in insulin use in type 2 diabetes over a nine year period. But it seems that it’s not just the NHS that needs to hear what pharmacy has to say. The public do too. North London LPC was inundated with enquiries about a newsletter it had produced raising awareness of pharmacy services in the area. So what does that mean to you as a pharmacist with a team already offering an established weight management service? Promote your service far and wide and show the public and the NHS what you’ve been doing to improve the health of the nation. Fin McCaul, for example, is first and foremost a community pharmacist practicing in Manchester. He is also the Chairman of the Independent Pharmacy Federation and works for Bury CCG one day per week as its Long Term Conditions Lead. Fin’s passion for independent pharmacy is second only to helping patients lose weight and stop smoking. With an average of 100 quits per year and well over 1000 patients helped through the weight loss service in his pharmacy, there is nobody better placed to talk about the opportunities and challenges for pharmacy now that Public Health commissioning has moved into the care of Local Authorities. Delegation, motivation and marketing skills and advice for pharmacists and their team are just some of the benefits from his Stop Smoking/Weight loss clinics. At the 2013 Pharmacy show he organised a series of Patient Services Workshops delivered by Pharmacists who are successfully running weight services in their local community and want to share their knowledge and expertise. Fin’s expertise and results are not just anecdotes. He, along with many of the pharmacies treating overweight and obesity are generating extensive audit data from their weight management services. 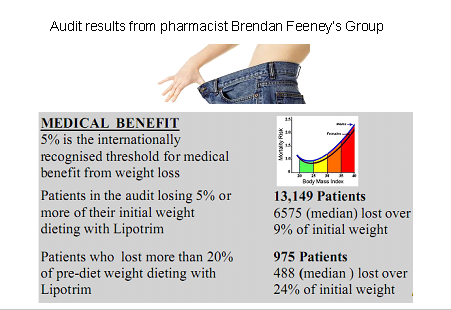 Results from one of his pharmacy audits below show the percentage of initial weight lost by over 1100 of his patients. Pharmacy is an excellent provider of weight services for the community. 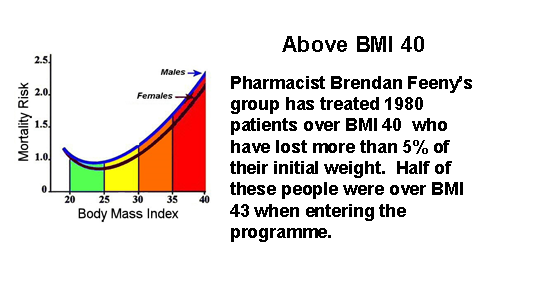 Many overweight people in the BMI 25-30 range take advantage of pharmacy weight loss programmes recognising that they really work and confident that they are being monitored by healthcare professionals. Pharmacists’ expertise in weight management, however has proven extremely valuable for the treatment of obese and even the morbidly obese people. This is a group who could have qualified for bariatric surgery at great expense, risk and often compromised future life. Effective weight loss absolutely needs to be monitored by knowledgeable healthcare professionals, because real weight loss is not benign. Type 2 diabetics, for example, who lose weight by compliance with a total food replacement diet programme, will induce remission of their diabetes within a few days and therefore continuing with hypoglycaemic medication can get them into serious difficulty. There are multitudes of patients taking medications such as warfarin or lithium, drugs which have a very narrow safety spectrum. Dieting can alter the absorption rate for these drugs so these patients need their dosages to be carefully monitored. There are some people who really should not be dieting at all. Pregnant women, patients with a recent history of surgery, stroke or heart attack are not logical candidates for weight loss. Effective weight loss should not be left to amateurs or internet sales. Healthcare professionals are needed, especially in pharmacy where continuous care can be provided even after the weight is lost, because weight maintenance requires the greatest attention and is not usually possible in a busy medical practice and appears to be almost impossible without professional help. Although it is traditional to show successful dieters proudly occupying trousers which are now several sizes too large, there isn’t enough space to print over 13,000 examples. Results from this single audit of a group of pharmacies out of a collection of more than 2000 UK and Irish pharmacies currently treating overweight and obesity, is a vivid demonstration of the evidence base being accumulated for this absolutely essential community service from pharmacy. Pharmacy is the only reliable community service providing and documenting long term weight management without the need major research grants or health service funding. Although there has been widespread press coverage for a £2.4 million grant by Diabetes UK to attempt to demonstrate that type 2 diabetes can be put into remission by effective weight loss, a fact that has been repeatedly reported in the medical press for over 30 years, pharmacies have been quietly and routinely succeeding with diabetes prevention and remission in their high street branches. Unlike bariatric surgeons, who need to justify the cost and risk of providing weight loss by surgical means on the basis of the phenomenal cost savings on the treatment of diabetes alone, weight loss in the pharmacy can accomplish the same results without massive expense and risk. And since total food replacement methods remove the substances of abuse for prolonged periods of time from those who may be suffering from a dopamine response to eating excess in their nucleus accombans , they don’t show the common addiction transfer syndrome that seems to be so common after bariatric surgery. While activists continue to bellow about the size of soft drink containers, pharmacists are demonstrating how much their education and skills can be amplified by the convenience of access on the high streets of the UK. Pharmacy stands alone among the healthcare professionals in providing fantastic public health services such as smoking cessation, weight management, diabetes recognition, prevention and even treatment, medicines review, hypertension assessment and a host of other essential services very much needed in the real world. A major thank you is overdue. This entry was posted in VLCD UPDATE and tagged audit, obesity, pharmacy-based programme, weight loss, weight management, weight reduction on 04/04/2014 by Lipotrim. The current excitement generated by the press coverage of the Newcastle University study of diabetic patients using weight loss by a very low calorie diet to “cure” diabetes, necessitates a wider recognition of the well established programmes already available. The Lipotrim weight loss programme, monitored exclusively by healthcare professionals has been in extensive use in the UK for more than 25 years. A rapidly expanding network of nearly 2000 pharmacies currently offer the VLCD service and although many have used manual methods to audit their patients’ achievements, the newly provided Patient Tracker computer software for managing patient records has permitted continuous auditing of results and detailed evaluation of population subsets. For example, in addition to auditing the total experience of patients enrolled in the pharmacist-run service, the results can be examined in many different ways. The cohort can be divided by gender, by age, by initial or final BMI, by amount or percentage of weight loss achieved, or by medical history (hypertension, diabetes, depression, thyroid problems etc.). The programme extends beyond weight loss, as there is a refeeding transition back to ordinary foods and a full maintenance programme, which is proving extremely successful in the pharmacy environment. With this Tracker audit tool, therefore, evidence is also available documenting the long term maintenance outcome after dieting. As a pharmacist who has been using the Tracker to keep my Lipotrim patients’ records for some time now, I would like to share a current audit of my patients’. Overweight or obese people requesting the programme are assessed for suitability on the basis of initial BMI and a detailed medical history. Those requiring medical cooperation, such as those with type 2 diabetes or medicated hypertension make suitable arrangements with their GP prior to dieting or are excluded. Those with contraindicated conditions, such as insulin dependant diabetes or pregnancy are excluded from the programme. Suitable candidates follow a strict regime of total food replacement using nutrient complete formulas, essentially very low fat enteral feeds, with adequate fluid intake and only black tea or coffee permitted in addition. Appropriate prescribed medications are continued as well. No other foods, beverages or supplements are permitted. Dieters are monitored and weights recorded weekly – only 1 week’s supply of formulas can be obtained at each visit and obvious non-compliance is corrected or the dieter is offered alternative weight loss advice. Records are maintained on the Patient Tracker programme. The next series of tables demonstrates the value of the Lipotrim service in overweight patients, reducing the likelihood of their progression to obesity, as well as obese, super obese, morbid obese or even super-morbid obese patients. 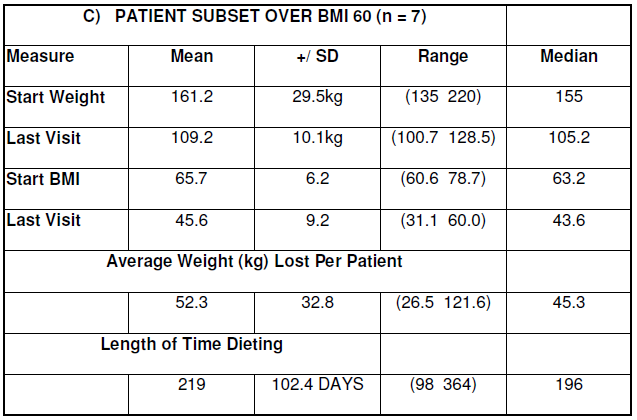 Table 7: Obese people who exceeded the 5% criterion for medical benefit of weight loss. Tables 8and 8a: Some dieters choose to interrupt their diet for varied reasons and then return for a subsequent diet period. Their first and second dieting courses can be examined separately. Table 9: After a period of weight loss, it is necessary to re-introduce carbohydrates in a controlled manner to minimise weight regain due to carbohydrate loading. Minimal weight change is expected despite reintroduction of normal foods. This phase is 1 week long. 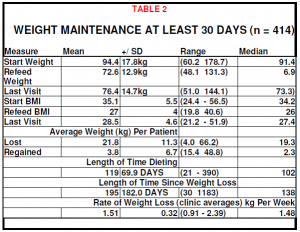 Table 10: The Tracker software distinguishes between periods of dieting and maintenance providing evidence of minimal recidivism when patients are properly supported in the pharmacy environment. Patients who are medicated for various weight related ailments can often be considered as different categories of patient. Many hypothyroid patients have experienced great difficulty with weight management. Depression and hypertension often have a weight component in the aetiology of the problem. The extreme flexibility of the Patient Tracker software, in addition to documenting and visualising each individual patient’s experience, allows for presentation of evidence of the weight loss achievements of cohorts of patients. This has become important for commissioning and the new ability of grouping patients from an individual surgery permits certification to the surgery of the collective progress of their patients, These results can be of value for CPD as well. 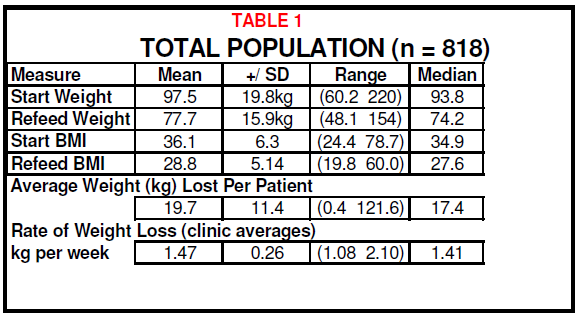 As can be seen from the multiple tables presented as illustration, the percentage of initial weight lost generally averages well over 5% and in most cases over 10%. Even the median values, which documents the half-way values of the ranges, are generally very close to the mean. Successful weight loss is found even in the extremely high BMI patients, who are usually refractory to weight management attempts. 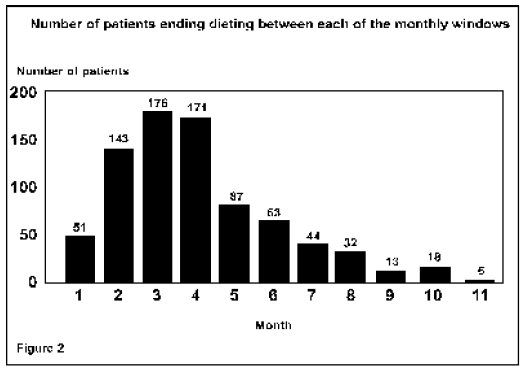 In addition to demonstrating the successful loss of weight by the dieters, regardless of the sub-category for grouping, it is important to note that even though there are some variations in patients’ experiences with re-feeding (Table 9) and follow on maintenance (Table 10), the overall lack of weight regain from the patients post-diet demonstrates the value of the pharmacist and the Lipotrim programme for long term weight control. Despite the fact that these results reflect the efforts of a single pharmacist in a programme that currently lists nearly 2000 pharmacies throughout the UK and Ireland, it is important to have the tools that can satisfy the need for documentation of achievement in this era of evidence-based treatments. The success of this pharmacy service has considerably enhanced my professional satisfaction as a pharmacist. This entry was posted in VLCD UPDATE and tagged BMI, calories, Lipotrim, results, VLCD, weight loss on 11/12/2012 by Lipotrim. Objectives: To assess the weight losses and weight maintenance achieved with obese, often medically compromised, patients following a common Lipotrim treatment protocol. Design: Data collation from voluntary responses by the practices to a general request for weight statistics, in a way that respects patient confidentiality. The sample of practices represents approximately 15% of those following the common protocol at the time of assessment. Setting: 25 general practices and 2 hospital clinics in the UK. Subjects: 818 obese patients registered with the practices or under medical referral to the hospital clinics The medical conditions ranged from apparently uncomplicated obesity to severely medically compromised patients, all treated under closely monitored conditions. Initial BMIs ranged from 24.4 to 78.7.
materials provided throughout programme; approached conceptually as an addiction control problem. Main outcome measures: Body weight and Body Mass Index at start of programme, at end of weight loss phase and the most recent follow-up available for each patient. Results: Weight losses totalling in excess of 16,000kg with high levels of compliance and clinically encouraging weight maintenance results. Conclusions: Obesity can be managed effectively under a variety of practice conditions, even in ‘heart sink’ patients who have repeatedly failed in the past to control their weight, despite the best efforts of the clinical team. Despite the prevalent academic knowledge of the medical problems associated with obesity (1-13), the frequent failure to achieve weight loss in obese patients has discouraged many practitioners from using weight loss as a primary treatment (2,18). Unless obesity is tackled, however, the scenario of a possible 25% of the population being obese by the year 2005 instead of the Health of the Nation target levels of 6 to 8 percent as in 1990 (14,15), will continue to be a health care frustration. The impact of effective obesity treatment in general practice, however, is very dramatic. When patients with type II diabetes lose significant weight quickly, glycaemic control is improved better than the same weight loss achieved more slowly, and this appears robust even in patients where some weight is regained (7, 9, 10, 11, 16, 17). also been able to reduce dosage or totally eliminate medication, often after only modest weight loss (7,11). The impact of such major health improvement sin patients with long-standing and progressive disease provides the momentum for practices to continue to devote effort and resources to obesity management (25). This paper reports a META-AUDIT of weight loss and maintenance results from ongoing obesity management programmes in UK general medical practice sites and hospital clinics following a common treatment protocol. Total weight lost by 818 patients was 16,211kg (16+ tonnes). refeed refer purely to those patients who have completed their weight loss phase and resumed conventional food for at least one month. At each site, patients join the programme solely at the medical discretion of the doctor who is versed in the protocol. In accordance with NHS practice, there is no financial consideration to the practice, from any source. The role of the GP is primarily the medical selection of appropriate patients and the monitoring of prescribed medications, which often have to be reduced or stopped as a result of the weight loss. Patients are seen weekly, usually by a designated and trained practice nurse. In rare cases, extremely medically fragile patients are dieted and these cases are generally seen regularly by the GP. In general practice, the GP orders the Lipotrim formula foods weekly by positive release using a Special Order. This assures that patients cannot obtain the diet from the chemist without the knowledge and approval of the GP who is properly informed about the Lipotrim programme (26-28). The Lipotrim is a nutrient complete very low calorie diet (VLCD) formulation. The diet is purchased from a local Pharmacist. This is the patient’s only access to the diet. Control of access is totally under the GP’s authority. Patients are expected to comply with the rigid diet and maintenance protocols. These are explained in detail by written material, video and audio taped sessions. Interactive lecture sessions are provided for patients and staff. Most practices limit the number of patients treated at any one time. Available places are rapidly filled from a waiting list. 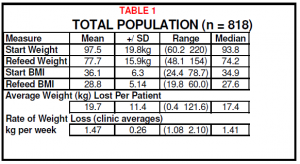 The results demonstrate that significant (Table 1) and sustained (Table 2) improvement in the weight of obese patients can be achieved under varied medical practice conditions. 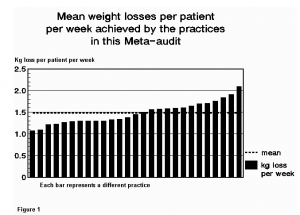 Individual practices were able to achieve a range of mean rates for weight loss in their patients (figure 1). The expected rate of weight loss for full compliance with the programme is an average of 1.46kg per week (1 stone per month). This was achieved. A subset of 414 patients, who had completed their weight loss phase at the time of audit and were attempting to maintained their weight, were evaluated. The clinical options for very fat people are limited. Most GPs despair of treating the massively obese. 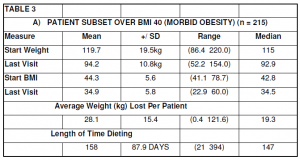 The population in this audit compilation included 215 patients over BMI 40, 30 patients over BMI 50 and 7 patients over BMI 60. Results from these patients are documented in Table 3 A-C respectively. Many of these patients are still in the weight loss phase (see Table 3). The widespread apathy apparent in the general medical reluctance to deal with the obesity problem stems from a long history of futile efforts. Whether this is related to the ineffective modes of treatment offered, a general lack of understanding by either the patient or health professional, or a combination of both, is not clear. The prevailing view has become ‘diets do not work’ (18, 27). This view needs to be altered to reflect the very real difference between dieting protocols. Some standard weight reduction diets can work for some overweight patients. Applying the same approaches to the obese, however, will frequently result in failure. 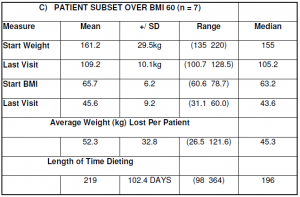 Obese patients require a more decisive treatment protocol (28). Rates of weight loss achieved per practice were shown in Figure 1. The premise that weight control is futile is unjustified and clinically insupportable when one considers that obesity itself is a risk factor for many serious clinical conditions (19). A large proportion of normal surgery time is spent dealing with many minor ailments, which are fundamentally weight related and which can escalate into serious disease when the weight problem reaches obesity (Body Mass Index >30) (20). Obesity occurring within a family unit can compromise the well being of that unit. The family ‘ill health’ is particularly problematic when the mother is obese. Depressive states and impaired quality of life (8) can affect a significant part of the patient’s daily routine and impact on the rest of the family members. A multiplicity of problems can be traced to obesity within the family. Much is said about the need to educate and modify lifestyle (20), but the impact of dietary education is considerably grater when the patient is in a positive state of mind, with improved self esteem resulting from weight loss. Sedentary lifestyles are often a consequence of the excessive weight. With weight loss, most patients become significantly more active. This has been shown to increase the probability of maintenance of the lost weight (21). the patient access to certain surgical procedures, for blood lipid control or increased mobility or pain relief in an arthritic patient. Clinical judgement will require consideration of age, lifestyle and medical condition in setting realistic weight targets for an individual patient. The current ‘fashion figure’ is not the appropriate determinant of the weight target in the obese. Weight regain needs to be put into perspective. The percentage of patients maintaining weight loss after medical obesity treatment far exceeds previous statistics (22). Long term weight maintenance at encouraging levels is now commonly reported for medical VLCD programmes (23,24), particularly when these include behavioural modification. There are no permanent cures for obesity. Despite this, an increasingly large number of patients can manage to maintain control for long periods after weight loss, albeit to varying degrees. A patient, however, who has lost 100kg and has regained 50kg is still 50kg lighter. This is particularly important where the lowered weight has allowed necessary surgery to be performed or improved another condition. The evidence of Wing, previously cited, and others (7, 11, 16, 17), suggests that some health benefits of weight loss (glycaemic control) can outlast the weight loss. 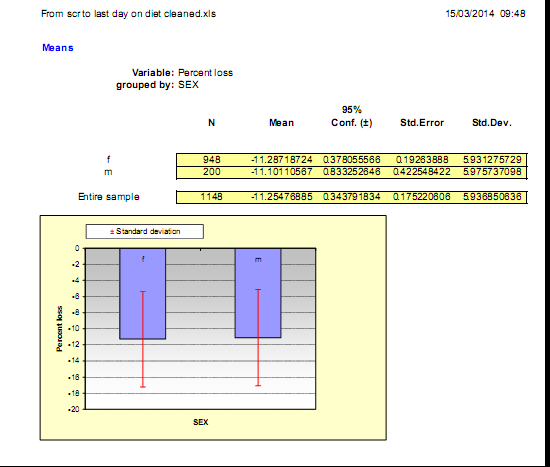 assess the proportion of non-starters from the data available. The referral procedures into the programme vary widely from site to site. At some sites, access to the programmes is exclusively based upon the medical requirement for weight loss in an attempt to mitigate a pre-existing clinical condition. These referred patients are sometimes reluctant to comply or are disinterested in weight loss. In others, there is a component of self-referral, although the regulation of admission to the programme still remains entirely under the control of the practice. How many patients are referred to the programmes and decline participation cannot be estimated from the data available. provided data from those patients who failed to attend beyond 1 week, but most did not. Our analysis, therefore, includes all patients who participated for at least 2 weeks. The data demonstrates that established patients complete the course. 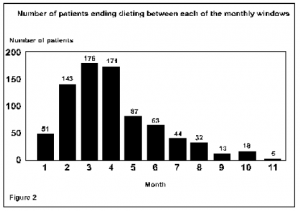 Figure 2 depicts the fraction of the 818 patients who stopped dieting within monthly intervals. 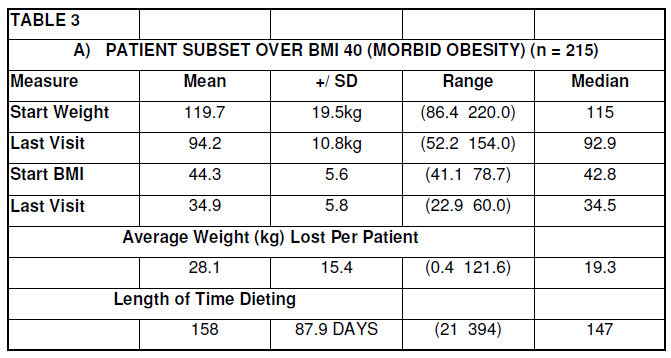 In Figure 3, the mean BMI changes for the subset of patients whoceased dieting within those monthly checkpoints are presented. Patients conclude dieting for many and varied reasons, only one of which is non-compliance and failure. These failures are included in the 6 percent (51 patients) of patients who discontinued during the first 4 weeks of treatment. Patients stop when they have achieved clinical goals, as discussed previously. It is evident from this graph that patients, on average, continue their weight loss programmes until they are no longer obese, regardless of their BMI at the start. National Task Force. Very Low Calorie diets. JAMA 1993, 270, 8, 967974. West KM. Diet Therapy of Diabetes: An Analysis of Failure. Ann Intern Med 1973, 79, 425434. Anderson J W, Hamilton C C, Brinkman Kaplan V. Benefits and Risks of an Intensive Very Low Calorie Diet Programme for Severe Obesity. Am J Gastroenterology 1992, 87, 1, 615. Chiang B N, Perlman L V, Epstein L V. Overweight and Hypertension: A review. Circulation 1969, 39, 403421. Maxwell M H, Heber D, Waks A U, Tuck M L. The Role of Insulin and Norepinephrine. Kannel W B, brand N, Skinner J J, Dawber T R, McNamara P M. The Relation of Adiposity to Blood Pressure and Development of Hypertension: The Framingham Study. Ann Int Med 1967, 67, 1, 4859. Wing R R. Use of very low calorie diets in the treatment of obese persons with non insulin dependent diabetes mellitus. J Am Dietetic Assoc 1995, 95, 5, 569572. Sarlio Lahteenkorva S, Stunkard A, Rissanen A. Psychosocial Factors and quality of life in obesity. Int J Obesity 1995, 19, 6, S1S5. Paisey R B, Harvey P, Rice S, Belka I, Bower L, Dunn M, Paisey R M, Frost J, Goldman P, Ash I. Short term results of an open trial of very low calorie diet or intensive conventional diet in type 2 diabetes. Practical Diabetes Internat 1995, 12, 6, 263267. Kirschner M A, Schneider G, Ertel N H, Gorman J. An Eight Year Experience with a Very Low Calorie Formula Diet for Control of Mahor Obesity. Int J Obesity 1988, 12, 6980. Wing R R, Greeno C G. Behavioural and psychosocial aspects of obesity and its treatment. Ballier’s Clinical Endocrinology and Metabolism 1994, 8, 3, 689703. Office of Health Economics. Obesity 1994, 112. Berg F F. Health risks of obesity. Obesity and Health 1993, 10-35. The Health of the Nation. Department of Health. London HMSO, 1992. The Health of the Nation. Health Survey for England 1991. Social Survey Division of OPCS. London HMSO, 1993. Hernandez-Bayo J A, Herranz L, Megia A, Martinez-Olmos M A, Hillman N, Grande C, Pallardo F. Factors related to successful outcome after rapid weight loss in obese patients with NIDDM (Abstract). Int J Obesity 1995, 19, 2, S135. Hanefeld M, Welk M. Very low calorie diet therapy in obese non-insulin dependent diabetes patients. Int J Obesity 1989, 13, 2, 33-37. Berg F M. Effectiveness of treatment. Health risks of obesity. Obesity and Health 1993, 85-89. This entry was posted in VLCD UPDATE and tagged rapid weight loss, VLCD on 11/12/2012 by Lipotrim.